June came in with a whirlwind of activity and before I could blink the school year was over. In my haste to get things done, I completely forgot to take photos of the basket my son and I made for his teacher. This is the only photo I took. I was so proud of him. He sewed the handles and the lining all by himself and then I put everything together. We lined it with teal paper grass (leftover from Easter) and filled it with some homemade muffins, homemade vanilla extract, an apple, and a handmade card. Darn it for not remembering to take a photo! (This was also the last project for my 2nd quarter 2016 Finish Along, but I'm not sure if this counts without the completed photo). how good to see him at the sewing machine you will make a quilter of him for sure then there will be disputes over who uses the machine and you will have to hid your stash from him. Drat that you didn't get a photo, but oh what a cute one you did get! It's wonderful that he likes to sew too. What a good mommy you are, teaching him the importance of personal thank you's at such a young age! I'm participating in the FAL too. You have my vote on this one, if that counts for anything! I've got to make sure I've blogged about my finishes. Thanks for the reminder! It sounds like a lot of handmade loveliness was in that basket. I love that you son helped make it too! 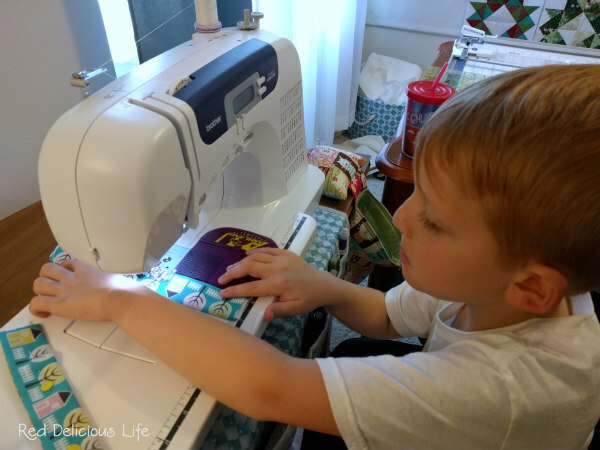 I absolutely LOVE to see kids sew!!! Good job, Mom!! He is a doll!!! I will certainly count this one. I am using Mr. Random as we speak to pick prizes. There are times when life requires a bending of the rules. So, rest assured, if your number comes up you will qualify. My son used to do this type of thing for his teachers too.